We offer 5 qualities of mattress protection maximising the possibilities of protecting your mattress against all eventualities ! It is the double sided nature of the 100% cotton flannelette of our products that guarantees COMFORT and WELL-BEING. Our products are machine washable to 90° and can be tumble dried for greater PRACTICALITY. 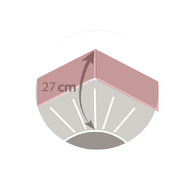 Corners are reinforced with elastic for greater strength and ensuring the durability of our products. Deep pockets of 27cm mean that our products are ADAPTABLE to the majority of mattresses at a time when mattresses are increasingly deep. Our products are guaranteed " Made in France"
An enhanced quality of mattress protection. Washable to 60°, our products are Téflon® treated for stain resistance and Microstop treated against dust mites. PRACTICAL aspects in terms of hygiene and cleanliness for your mattress. 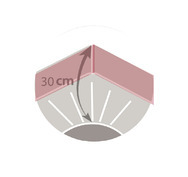 Grâce à leur composition Molleton 100% Coton gratté côté dormeur et côté matelas et leur grammage élevé, nos produits sont ultra CONFORTABLES, préservant votre bien-être. A polyurethane coating on the reverse of our mattress protectors brings a waterproof guarantee. Machine washable to 60° these protectors can also be tumble dried for greater PRACTICALITY. The 80% cotton terry towelling quality of this product means that these products are COMFORTABLE and BREATHABILITY thereby increasing weel-being. The terry towel quality brings a stretch finish and the polyurethane coating on the reverse of ur products a WATERPROOF guatantee for made-to-measure mattress protection. Machine washable to 60° this is a truly PRACTICAL product. In addition to the elasticated reinforcement in the corners, our products are STRENGTHENED by the addition of pockets and lateral bands in 100% cotton which will only serve to further increase the life of your mattress. The very deep pockets of 30cm render our products ADAPTABLE to all types of mattress at a time when mattresses are increasingly deep. Our products are guatanteed "Made in France" transformed entirely in our factory and subjected to rigorous internal quality controls.